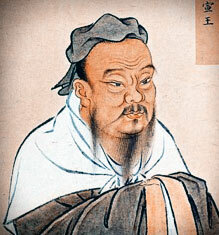 There is a legend that the famous philosopher Confucius invented the game, but that has not been verified. Part of the reason for this myth is that historians have noted that the three dragon tiles agree exactly with Confucius' mentioning of the three noble virtues. These virtues are sincerity, filial piety, and benevolence. In addition, Confucius liked birds and the name Mah Jong has the word "sparrow" in it. If the myth is true, then the game would have originated in China as far back as 500 B.C. Aspects of these particular rituals are associated with how the shuffling is undertaken, how the four walls are constructed out of the tiles, how the tiles are dealt, and how the "kong box" is created. Some may be perplexed as to why all these seemingly unnecessary rituals have been incorporated, but it is important to remember that Mah Jong was primarily a game used in gambling, and these seeming innocuous or superfluous rituals often were a way to prevent cheating when the game was played. Although an American anthropologist by the name of Stewart Cullen wrote a paper mentioning the game of Mah Jong in 1895, it was not fully introduced into American culture until about this same time - the 1920s. The company Abercrombie & Fitch was the first company to sell Mah Jong sets. It became such a resounding success in New York that one of the co-founders of the company, Ezra Fitch, decided it would be a good idea to dispatch a number of emissaries to cities in China to buy up all the Mah Jong sets they could find. In their years of production, Abercrombie & Fitch ended up selling around 12,000 sets of Mah Jong. In 1923, the game was first published in Britain, and it took off in popularity there as well. The game was so popular over there that it even made its way to the British outposts in India, and Brits over there would play it quite regularly. The British, however, tended to adhere to the original Chinese rules of Mah Jong and avoided playing by the rules devised by the Americans. Today Mah Jong is played all over the world and numerous manufacturers make the sets. While the game remains marginal compared to chess and backgammon it still retains a place in the games world. One of the foremost retailers of the sets today is The Regency Chess Company of England. They stock a wide range of sets including basic Chinese ones as well as fine luxury Italian versions. Their blog is a wealth of information about the games as well a new products and general company developments.